Justin Drew Bieber (born March 1, 1994) is a Canadian singer-songwriter. After talent manager Scooter Braun discovered him through his YouTube videos covering songs in 2008 and he signed to RBMG, Bieber released his debut EP, My World, in late 2009. It was certified platinum in the US. He became the first artist to have seven songs from a debut record chart on the Billboard Hot 100. Bieber released his first full-length studio album, My World 2.0, in 2010. It debuted at or near number one in several countries, was certified triple platinum in the US, and contained his single "Baby". In 2009, Bieber toured with Iyaz and Taylor Swift, and traveled in the United States. He signed to a record deal with Usher. He released My World, Part 2 in March 2010 as his second album, as well as going on a world tour. Bieber has released a book titled Justin Bieber: First Step 2 Forever: My Story. Bieber was born in London, Ontario, at St Joseph's Hospital, and was raised in Stratford, Ontario. He is the only child of Jeremy Jack Bieber and Patricia "Pattie" Mallette. His mother is of French-Canadian descent; his paternal great-grandfather was of German ancestry, and his other roots are English, Scottish and Irish. Bieber attended a French-language immersion elementary school in Stratford, the Jeanne Sauvé Catholic School. Growing up, he learned to play the piano, drums, guitar, and trumpet. He graduated from high school in Stratford, Ontario, the St. Michael Catholic Secondary School in 2012. In early 2007, aged 12, Bieber sang Ne-Yo's "So Sick" for a local singing competition in Stratford and was placed second. His mother posted a video of the performance on YouTube for their family and friends to see. She continued to upload videos of Bieber singing covers of various R&B songs, and Bieber's popularity on the site grew. When searching for videos of a different singer, Scooter Braun, a former marketing executive of So So Def Recordings, clicked on one of Bieber's 2007 videos by accident. Impressed, Braun tracked down the theatre that Bieber was performing in, located Bieber's school, and finally contacted his mother. At 13, Bieber went to Atlanta, Georgia, with Braun to record demo tapes. Bieber began singing for Usher one week later. Bieber was soon signed to Raymond Braun Media Group (RBMG). Justin Timberlake was also reportedly in the running to sign Bieber but lost the bidding war to Usher. L.A. Reid signed Bieber to Island Records in October 2008. Bieber then moved to Atlanta with his mother to pursue further work in 2008. Bieber's first single, "One Time", was released to radio while Bieber was still recording his debut album. 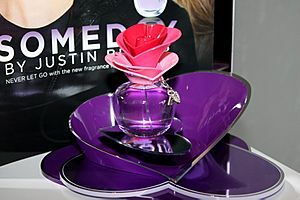 The song reached number 12 on the Canadian Hot 100 during its first week of release in July 2009 and later peaked at number 17 on the Billboard Hot 100. During fall 2009, it had success in international markets. The song was certified platinum in Canada and the US and gold in Australia and New Zealand. Bieber has cited The Beatles, Boyz II Men, Mariah Carey, Michael Jackson, Justin Timberlake, and Usher as his musical inspirations. Bieber stated My World 2.0 was influenced by Timberlake. As Bieber resides in the United States, he is reported to possess an O-1 visa for temporary resident status, based on "extraordinary ability or achievement" in a field. 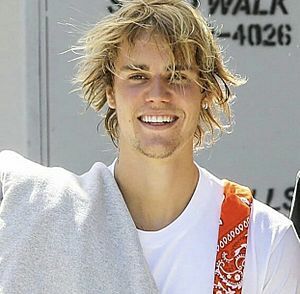 In September 2018, TMZ reported that Bieber had begun the process of becoming an American citizen upon marriage to Hailey Baldwin. As of July 7, 2018, Bieber is engaged to American model and television personality Hailey Baldwin. Bieber and Baldwin obtained a marriage license in September 2018, leading to reports that they had a civil marriage ceremony at that time, with a religious ceremony to come shortly. On September 14, Baldwin stated on Twitter that she and Bieber had not yet married, and were planning for the upcoming ceremony. Throughout his career, Bieber has sold an estimated 140 million records, and is one of the best-selling music artists globally. On November 23, 2012, Bieber was presented with the Queen Elizabeth II Diamond Jubilee Medal by the Prime Minister of Canada, Stephen Harper. He was one of 60,000 Canadians to receive the Diamond Jubilee medal that year. In 2013, Bieber received a Diamond award from the Recording Industry Association of America (RIAA) to recognize his single "Baby" as the highest-certified digital song of all time. 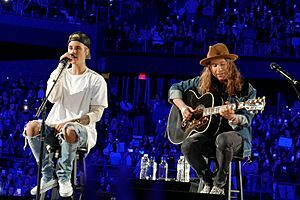 Bieber has earned ten Grammy nominations (including one win), two Brit awards, four NRJ Music Award nominations (including three wins), thirteen Billboard Music Awards, and numerous fan voted accolades which include eight American Music Awards and twenty Teen Choice Awards. He also has won eighteen MTV Europe Music Awards, which is the most awards received by a single artist to date. On November 13, 2015, the release of Purpose marked his sixth album to debut at number one. He also became the first artist, since Elvis Presley in 2005, to replace his own song as number one on the UK Singles Chart. 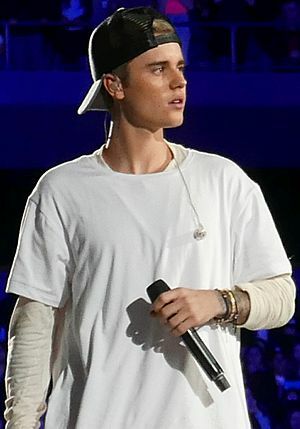 As of 2016, Bieber has received fourteen titles in the Guinness World Records, which include eight that were achieved from the success of his album Purpose and was featured in the 2017 Edition. These records included the most streamed track on Spotify in one week, the most streamed album on Spotify in one week, the most simultaneous tracks and most simultaneous new entries on the US Billboard Hot 100 by a solo artist, the first act to occupy all top three positions simultaneously on the UK Singles Chart, the most followers on Twitter by a male, the most viewed music channel on YouTube by an individual, and the most subscribers on YouTube for a musician by a male. Bieber was included among the top ten in The Highest-Paid Celebrities Under 30 annual list in the world by Forbes magazine. He has been listed six times in 2011, 2012, 2013, 2014, 2016 and 2017. He is the youngest star, and 1 of 7 musicians on the list, having raked in $53 million in a 12-month period. Justin Bieber Facts for Kids. Kiddle Encyclopedia.